I changed its name because i am planning another card called Exploration. 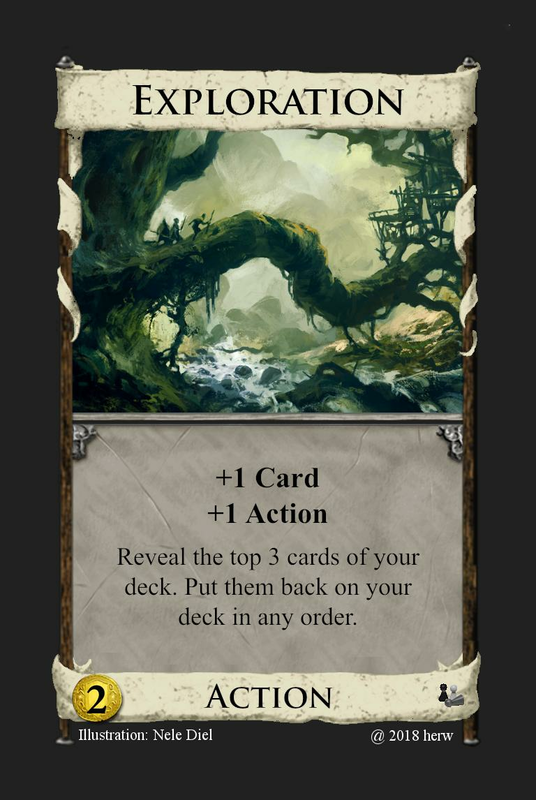 It has same cost as laboratory (+2 Cards +1 Action) so there is a small bonus for each other. But why "reveal" instead of "look at"? To trigger Patron? this is also better because now your opponents don't see the cards. thanks for helping. I think costs of 5P are enough. a wording question: is it clear that the reaction part is meant as „instead” of gaining a card or should i add „instead”? Wasn't clear to me. In the current version, it sounds like the Reaction ability just happens additional to the gaining. I would rather use "would gain" and "instead". 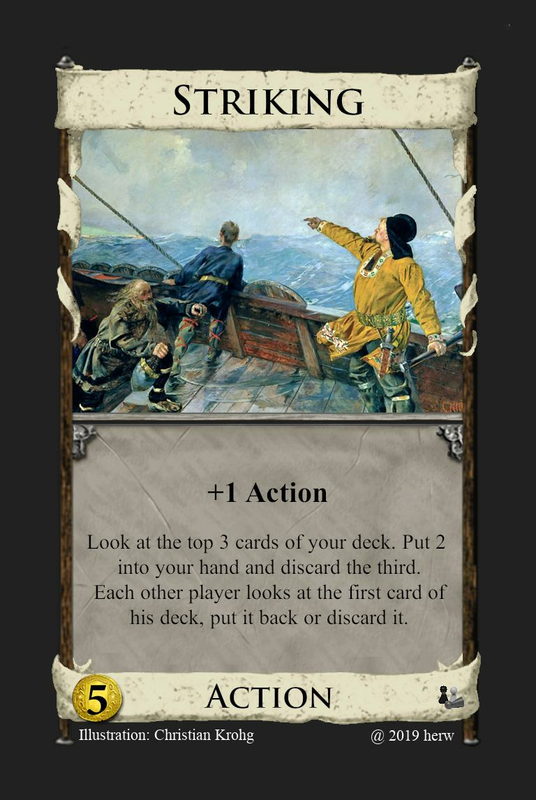 When you would gain a card during another player's turn, you may reveal this from your hand, to instead discard this and any number of non-Action cards, and then draw as many. I'm sorry to say, I don't really like it. It seems slow to resolve, and during another player's turn on top of that. It also has a lot of words, and generally speaking, I don't think additional would-gain cards similar to Trader are a great thing. Even Donald has expressed regrets regarding the rules-mess of Trader, whereas he doesn't mind Watchtower. 5$ and a Potion is also really expensive, too expensive for the trashing to be useful, as it will become available only late game, where trashing is usually bad. Also, the attack is arguably worse than Witch. The Copper junking also keeps going and going, which is usually considered poor style, but again, it happens very late, so it might actually be fine for opponents who have started greening. Finally, the card has a lot going on. It trashes, it junks... Considering how late you get this and that it is terminal unless you trash with it (which, as stated, is less easy late-game), you can't even chain it that well, which again isn't that great a fit for a Potion card. I know you love Potion cards, but I feel this really doesn't want to be one. Yes, fully agree. Characteristic of bad card design are too many words, complex wording and complex rule, wrong costs . I choosed Coppers instead of curse, because i want a long effect. But you are right, Coppers instead of Curses is only a game of gaining and trashing. The main ideas are a powerful wizard and a picture in my head of two equipollent wizards who are fighting against. So it is wished that all players will have one. So it should be still powerful, although when the curse pile is empty, for both parts attack and reaction. The reaction part could be a Moat, but that's not what i have in mind. This has the problem that the Reaction portion can be stacked indefinitely by revealing the same copy of Counter Magic over and over. About the main concept, an Attack that is also its defense: Any cursing attack is its own defense. Witch only can deal out a fixed number of Curses each game. A good way to keep them from going in your deck is just distributing them yourself. So every Witch IS her own counter spell. I know I'm raining on your parade a lot here right now, but I kinda feel you are trying to re-invent the wheel here. Sorry. so only one reaction no stacking with same card. 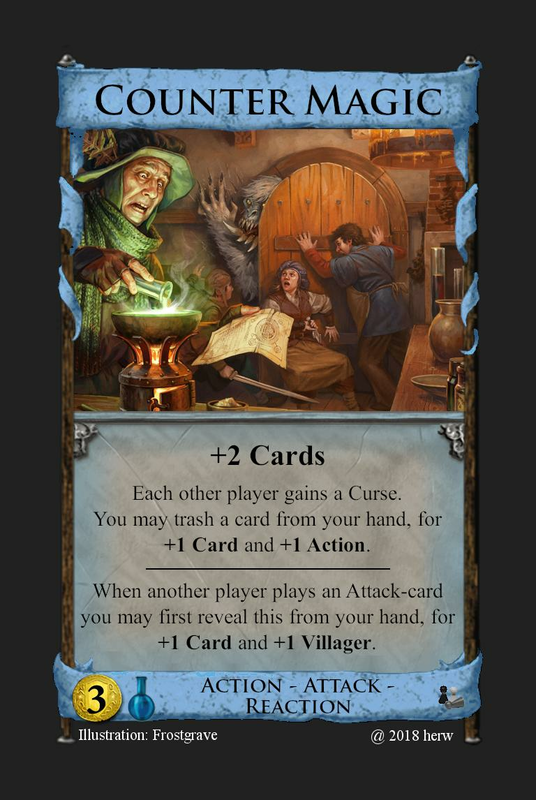 Another idea of this card is that with an empty curse pile it is still a powerful card and attractive to play from both sides. Maybe there are other non cursing Attack-cards in play? Your idea is, that the first part shouldn't be an attack but something other action or separate both to two different cards; only Attack-card and the other only action-reaction card? Well, I'm not saying I have a great idea to fix it. I'm just saying that if one or more Cursers are in the kingdom, you usually want one. Even if it's mostly to keep the number of Curses given to you at bay. So a card that Curses and defends against Cursers doesn' t create considerations that are all that different from a card that just Curses. Either way you need one to both defend your deck and attack the opponents'. Consider this: Witch has one thing it does to keep you from getting too many Curses: Distributing them to your opponents. This has 3: Distributing Curses, trashing, and a Reaction. Two would be fine to bring the point across. had done: no curser, so no attack (see my last post) but still trashing and reaction. Another way of wording this that might be better is to give + as a resource when you play it. I've seen that idea done on other fan cards. One big problem with it is that it might be the only Potion-costing card in the game; in which case it needs to be good enough by itself. Another way of wording this that might be better is to give + as a resource when you play it. I've seen that idea done on other fan cards. The trick is, that you can buy more than one potion-costs-card without potion in your hand this turn. One big problem with it is that it might be the only Potion-costing card in the game; in which case it needs to be good enough by itself. yes and therefore it costs only 2 treasures + potion. So you can buy itself for only 2 treasures and you get +1 action + 1 Buy extra. If you want more i can change to +2 actions +1 card +1 Buy for 3 treasures and potion. So you would get a cheap vilage +1 Buy when buying with Forrest Village. Maybe this would be too strong. All cards cost Potion less this turn, but not less than no Potion. I don't think so. The only reason to do + is clarity / less wordiness. Even if you get a deck with extra Buys and can thus use the price reduction of Forest Village to purchase some new villages for $2 (instead of the "normal" price of $3) the opportunity cost (buy Potion, have one extra stop card in your deck, can only buy one village per shuffle) to get there is pretty huge. I seriously doubt that Forest Village will be better than any $4 village (even Mining Village) in any Kingdom (if Workshop variants are around it is a no-brainer). many thanks for correct and simple wording - you have to remember, that i created victory cards with potion in cost. So: All non victory-cards cost Potion less this turn, but not less than no Potion. my favourite version has an extra buy so, + is not the same. You imply only one card with potion in cost. I think it is not fair because if you choose cards with potion-costs you should coose three (see Donald's comment to Alchemy). I think Alchemy is a small unfinished set and i try to expand. So i am not thinking about only one card. If you would play Prosperity only with Colony and no Platin it would be not useful. I think there should be more openness to Potion. (sorry for wrong English - i am a non native speaker). No. 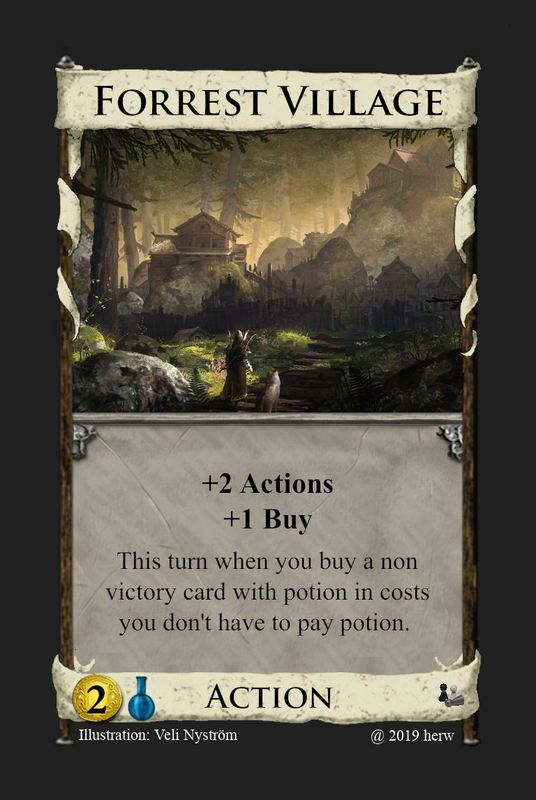 All Potion cards are designed such that you want to get multiples, such that even if there is only one Potion card in the Kingdom the opportunity cost of going for Potion is often acceptable. Designing a card with Potion costs such that it is only decent if there are other Potion cards in the Kingdom is IMO plain bad; it makes the card depend too much on the Kingdom-selection meta. Unless you want that card to be only good for your specific "at least 3 Potion cards" games but then you might want to add a disclaimer to your Potion cards that they should only be used in Kingdoms with at least 3 other Potion cards. I'm afraid that I'll have to say some things you might not want to hear now, herw. It says right there that this is not something you have to do. In fact, most people don't do it. It is a hotfix Donald X included to make sure that in case the card he put together under a lot of time pressure by the publisher would still work fine. We all know that to buy a Potion card you need to get a Potion. What a lot of people are unaware of is that this means that, if you only ever want one Potion cost card, you would end up with a 50% dead card quota from getting it and Potion. That's awful. To remidy this, Donald X made sure that all Alchemy cards are cards you want to get multiples of, even if there was only one of them in the kingdom. The suggestion in the rule book is a safety net. Assuming that this was something you could count on, treating it as a fundament of your designs, puts too much strain on it. As a result, you constantly underestimate the opportunity cost of Potion cards. You rely on the value on the official Potion cards, hoping that they would make yours worthwile; but frankly, several of the official Potion cards are horrible, and you are adding further weak cards. As a result, the net grows thinner and thinner, with the result that even if you'd set the game up to always have three Potion cards in the kingdom, now they are more likely to be three weak Potion cards. As a general thing that I learned over the course of several years: Don't try to make cards with the main goal to fix something. Don't make a card to boost Scout, or harm Rebuild (those are things that I actually tried in the past). And don't make cards to boost Potions. Because if you focus on making cards Potion costs or to boost Potion cost more than you care about making good cards, you will start attaching Potion costs to cards that don't need or want them. You will be missing out on good card ideas by shoehorning them into something that doesn't work with it. In the end, the cards will end up generally worse because of this. I have stated this before: Potion cards are very tricky to do right. Look at Alchemy, and how many cards of it are bad. Even Donald screwed up several of them. If you are a relatively inexperienced card designer, Potion cards are one of the worst places to start with. But if you must make a Potion card, at least try to apply the same constraints that Donald applied. Make cards attractive in multiples. Make them work well in kingdoms without other Potion cards. Perhaps you can learn from Donald's mistakes and make the cards not too slow. But don't lean on a safety net. Thats not what it's for and it can't carry that weight. Drawing two cards is a big problem, because you could draw your entire deck, if you have enough Counter Magic cards and maybe even hit a reshuffle to play the same Reaction cards again. You should give the + cards at the start of the next turn.